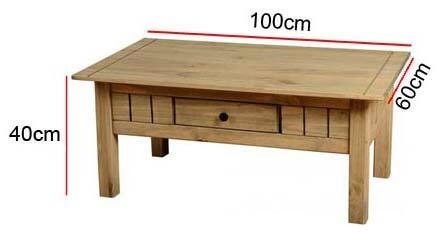 The Panama coffee table is the perfect height and size to sit central in your living room. The spacious top is perfect for all your essentials or for gathering friends and family. The Panama range is made from 100% solid pine, giving this range a really great quality look and finish. This coffee table beautifully displays the wood's natural grain, with a light and versatile finish. The rounded, black metal handle finishes off the table perfectly. This table is made from solid pine, with a plywood drawer bottom. Complete with a round metal handle. This Panama table is really easy to take care of. Wipe over with a duster or dry cloth for a dust free finish. Try a damp cloth for tougher marks. When moving your table, as with any furniture, it is always best to lift rather than dragging or pushing as this could cause structural damage.